about this book: The manner in which you approach the role of parent or step parent and the attitude you put forth will differ from those around you. You must pay particular attention to your actions so as to not alienate yourself from your partner or the children. Things to take into consideration when blending a family are: finances, living arrangements, holidays, grandparent responsibilities, and legal ramifications. These are just a sample of the items covered. I was inspired to write this book because I came from a long line of step-parents. There are many divorces each year and people jump into remarriage usually dragging the children behind them. There are important things to learn before making this jump. 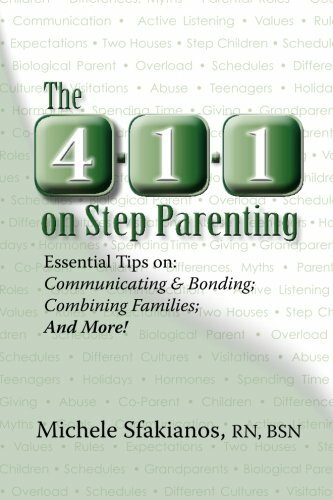 I am currently writing several "informational" books; therefore all of my titles begin with "The 4-1-1." I aim to provide as much information as possible to completely inform those wishing to combine families BEFORE they make that step. As a Registered Nurse, Life Skills Expert and award-winning author, I want to be able to help those that need it most. I believe children should come first and want to make sure other parents agree.